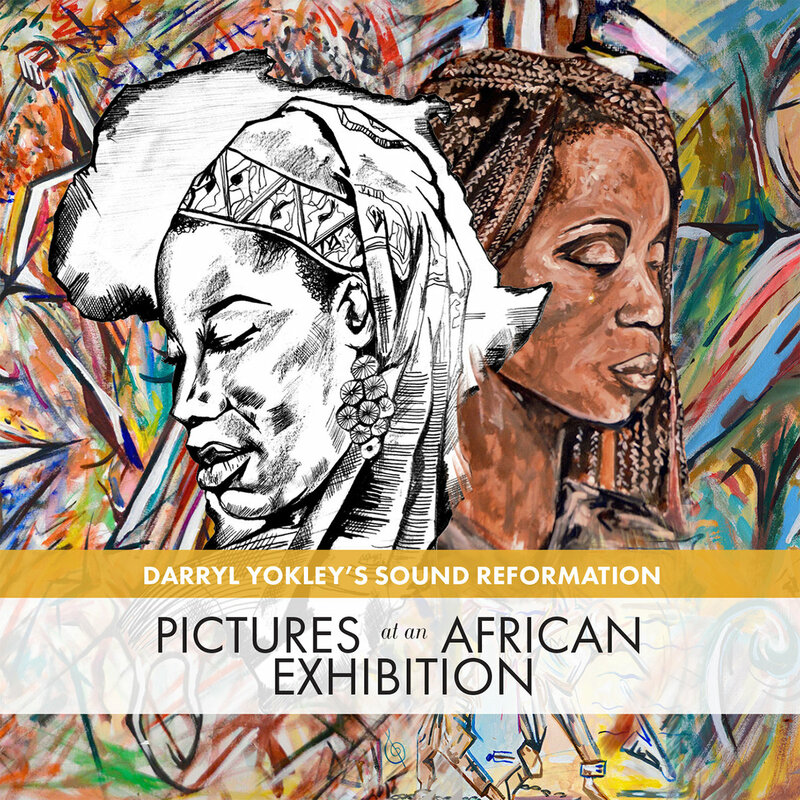 Jazz saxophonist and composer Darryl Yokley pays homage to Russian composer Modest Mussorgsky on his latest project, Pictures at an African Exhibition. While Mussorgsky’s inspiration for “Pictures at an Exhibition” came from artist Viktor Hartmann, Yokley collaborated with London-born artist David Emmanuel Noel on his similarly titled work. Drawing upon themes of the African Diaspora, Noel created original paintings inspired by each of the album’s 13 tracks. Yokely has been performing music from Pictures at an African Exhibition for the past four years with his band, Sound Reformation, featuring pianist Zaccai Curtis, bassist Luques Curtis, and drummer Wayne Smith Jr. The programmatic suite opens with the brief prelude, “First Sunrise,” marking the “dawn of humankind” in Africa. Following is “Migration,” an exploration of populations moving within and beyond the mother country. Yokely’s opening theme on this track is played in C, which he calls “the key of the earth.” This harmonious and carefree intro, enhanced with classical-style piano riffs, becomes increasingly agitated as the track progresses, with an ebb and flow signaling shifting populations that never return to their point of origin. “Ubuntu” and “Stories of the Village Elder” paint a rich sound collage while exploring African themes and rhythms, accentuated by Curtis’s kalimba-styled piano ostinato. The music takes a darker turn on “Ominous Nightfall,” as drums signal the approach of those seeking human chattel. Seguing into “Hunting Natives,” the band’s tight harmonies, sharply articulated attacks, and excellent solo turns combine into a masterful performance. “Birth of Swing” is another highlight—a wonderful slow and bluesy dirge drawing heavily upon New Orleans’ jazz traditions, with guest Nasheet Waits on drums. While this track celebrates the contributions of African American musicians, the painful beginnings are also expressed through the clanking of chains added to Smith’s percussion arsenal. Going forward, Yokely’s thoughts return to the motherland on tracks such as “Echoes of Ancient Sahara” sprinkled with Arabic motifs, the mournful then harrowing “Genocide March” which reenacts the Rwandan and Sierra Leone genocides, and “Cry, the Beloved Country” which moves from voices oppressed to freely articulated melodies resplendent in Yokely’s sax solos. This entry was posted in Jazz and tagged 2018, 2018 music, 2018 music review, Brenda Nelson-Strauss, CD review, Darryl Yokley's Sound Reformation, Jazz, Pictures at an African Exhibition, Truth Revolution Recording Collective by aaamc. Bookmark the permalink.